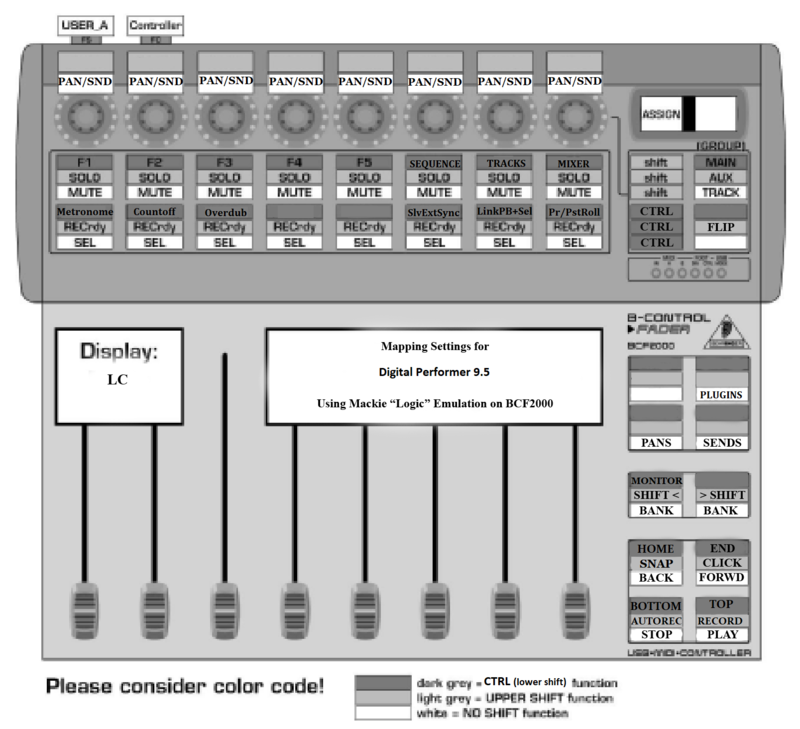 I’m working on this mapping chart for MOTU Digital Performer and the Behringer BCF2000 controller and could use some help with a few of the items. Where this document currently says “Does Nothing” there almost surely are functions being performed that I simply am not aware of. In the image, I’ve renamed a few of the button names. Here is the image, with the knob and button assignments listed below. Click the image to view full-screen in a new tab. After starting up the BCF2000 in “LOGIC” mode and then starting Digital Performer, the default setup is to have the sliders control the mixer faders (you must have the mixer tab selected as the focus, that is, it must be clicked on) in banks of eight tracks at a time (move through banks using the “Preset” buttons I’ve renamed as “Bank” in the image); the knobs control the panning for each track and when pressed do nothing in this mode; the buttons just beneath the knobs are track mutes and the buttons just above the sliders are to select the track being worked on within the current bank (if you have the “Track Inspector” window open you’ll see it change according to which of these bottom-row buttons you press). All the text with white-backgrounds in the image are the defaults. Modify the action of the knobs and buttons by using the “Encoder Groups” top-left and bottom-left I’ve re-labeled in the image as SHIFT and CTRL. The Encoder Group button on the bottom-right is used with SHIFT as a FLIP button that switches the knob functions with the sliders. Three Knob modes – Edit, Exit, and Track with Learn. Assigns the Knobs to control PAN. Pressing down on this knob does nothing. You can also press on a knob to enable/disable the associated track’s send. Sliders still control the volume faders and all buttons follow normal conventions with their SHIFT or CTRL modifier keys. See bottom of the post – I’d be careful with this one! CTRL plus the lower row of buttons toggles on/off various features of DP. With Slave to External Sync on, only Link Selection to Memory is toggled. –> Occasionally, toggling off Link Playback and Link Selection To Memory using the CTRL-7 key will switch to Auto-Stop and/or Auto-Rewind being toggled on. The only way to turn them off after that happens is by clicking them, it appears. CTRL with various upper-row buttons switches tabs. If coming from the Tracks Panel to the Mixer Panel, only the track previously selected as the focused track will appear. Pressing “Preset Left” or “Preset Right” (the bank switch buttons) brings all the desired sliders back into view. This is not an issue when returning to the Mixer from the Sequence Panel. FORWRD shuttle-plays in forward direction. Tapping second time speeds up playback. Shift-PLAY Starts Recording on Record-Enabled Track(s) IMMEDIATELY from the playhead position. Shift-STOP Turns ON Auto-Record (does not turn it off). Shift-FORWRD Sets Split Point (or Trim or Selection start point) at the play head position. If no tracks (or the conductor track only) are selected, it selects all and marks all tracks. Otherwise, it only applies to the selected tracks. You still need to perform the split (CTRL-Y) or Trim (Win-U) or shift-click using the I-beam to complete a selection. Shift-BACK Toggles Snap-To-Grid and Free-form for all tools. Especially useful for the I-Beam (which becomes “whiter” in the Free-form mode). SHIFT-PRESET-LEFT moves one-track-at-a time shifting to the left. SHIFT-PRESET-RIGHT moves one-track-at-a time shifting to the right. CTRL-PRESET-Left Toggles Monitoring (Audible Mode) On/Off. Pressing the upper-right encoder group button and “Learn” at the same time brings up the topmost plugin editor window for the selected track (you seem to need to have closed all open plugin windows first for this to work). Be super careful when the “Learn” button is selected. Turning a knob seems to make it get “creative” inserting plugins into the selected track with no apparent rhyme nor reason. Turning it VERY slowly you can see it moves to the next preset about ten seconds after you’ve moved the knob. I’d avoid this one other than to bring up the top plugin edit window. Please let me know of additions or corrections to this document and I will keep this first post and the image updated.